After Spike (a.k.a. “Pierce”) left The Roommates (yes, there was a fifth Roommate) in 1979 to join the Marines, a rather expansive punk group which qualifies for government assistance, the boys needed a drummer. 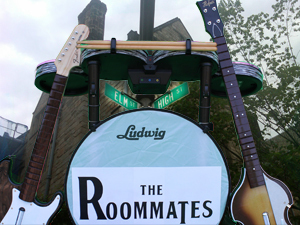 Most critics would have agreed that, even with Spike, The Roommates needed a drummer. Spike brief time with the three originals did leave three permanent marks. First, it was Spike’s hidden love for martial music that set the early war-like tone of the proto-group. Second, he inspired Ted to write his first hit, the now famous folksy rag “Blond-Haired Boy from Brooklyn.” Finally, Spike gave the other members something they would need to catapult them to instant fame: a deep distrust for trust. Not thinking at all about the possibility of success, they naively trusted Spike to stick it out with them. When Spike gave them the bad news in the spring of 1979, his three now ex-bandmates sat in disbelief until someone turned the lights on. Frank stoically began the interview process on April of that year. The quest for a replacement started and ended with Frank’s inquisition of Rich. It was said Frank sought another candidate for the job, but an outstanding warrant prevented that meeting. The name of that individual was never identified and lies in the ash heap of history, having disappeared in the same fiery maelstrom that ultimately consumed Frank. It didn’t really matter, though, since Ted and Scot immediately agreed to Rich’s inclusion. Rich had previous experience in the Latin-American scene as a mattress percussionist and that impressed Scot and excited Ted. Scot also mistakenly assumed Rich was a Red Sox fan, having misunderstood Rich’s short-hand for a series of violently bloody punches – “red socks.” Ted saw Rich as rife with potential, but was happy to leave all the paperwork to Frank. The new drummer was an immediate success with The Roommates and legitimized the band in the public eye. A roughneck in the early days, Rich’s comments during the Rock Waves interview were rife with “Gore! Blood! Violence! Violence and gore! and, and,… lots of expletives deleted!” As we’ve said, Rich was directly responsible for the anarchistic flavor of The Roommates. Rich had two top ten hits from the Destruction album (their first) – “Vampire Blues” and “Let’s Break Some Legs!” – with an equally popular sequel to the latter “Let’s Bust Some Heads!” When asked to explain his destructive demeanor, Rich expressed, “Violence is the norm, here!” The fans ate it up. So much so, in fact, that the night before the Zig Jones interview, five people were found with their heads smashed on the corner of Elm and High Streets, just blocks from The Roommates concert that evening. Rich was arrested live, on the air, during the Rock Waves show. The charge was ultraviolence. The case remained in the courts for three years until it was thrown out because no one cared anymore. With the table now set, The Roommates soon served to usher in a new decade of decadence upon a horde of hungry fans.